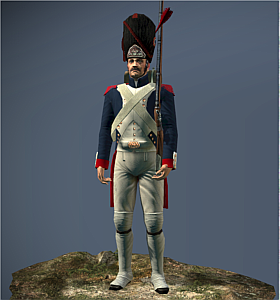 These highly trained and experienced troops are handpicked by Napoleon and act as part of his personal guard. Taken from the ranks of the Imperial Guard, the Old Guard is made up of the most intimidating soldiers the French army has to offer. Chosen specifically for their physical attributes and notably above average height, these men strike fear into the hearts of Napoleon’s enemies. Their prowess as soldiers is world-renowned and the mere presence of these men on the battlefield can inspire even war weary fellow Frenchmen to fight on. After his dramatic defeat in Russia, Napoleon bid farewell to the Old Guard. These men were his few remaining loyal soldiers but, with no support in Paris, Napoleon was forced to disband them. However, following Napoleon’s return from exile in 1815, they were recalled and marched triumphantly back to Paris with their leader. The end of the Old Guard came at the Battle of Waterloo where they were routed for the first and only time. For many of the French soldiers fighting that day, the retreat of the Old Guard was the end of the battle and the end of Napoleon himself.